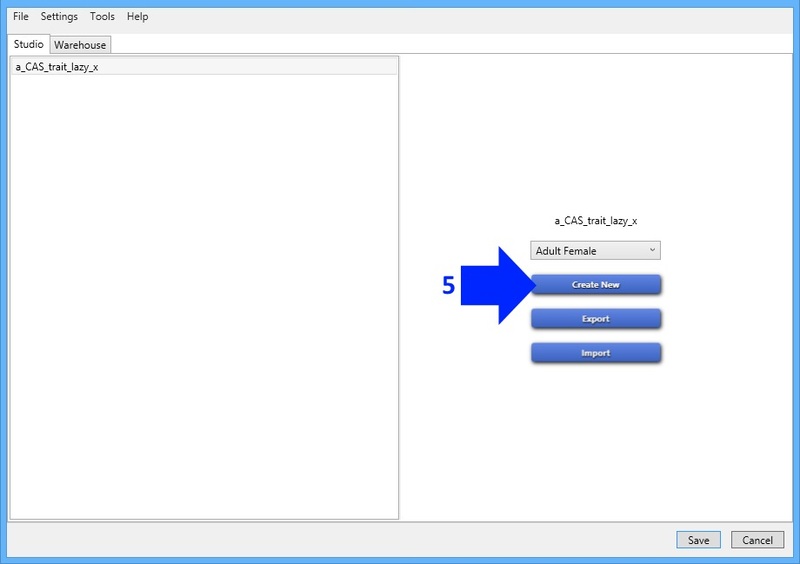 This tutorial will show you how to create a custom Sims 4 CAS pose .package. 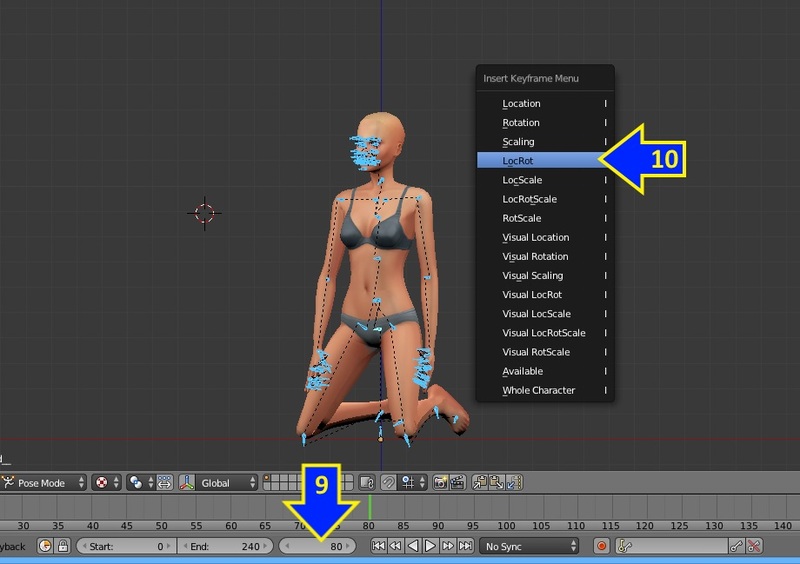 It will not show you how to use Blender to make the pose itself. Because of limitations on how these pose .packages can be used in CAS I make my poses rotate so the person using it can easily view it from all angles. This tutorial will show you how to do that. 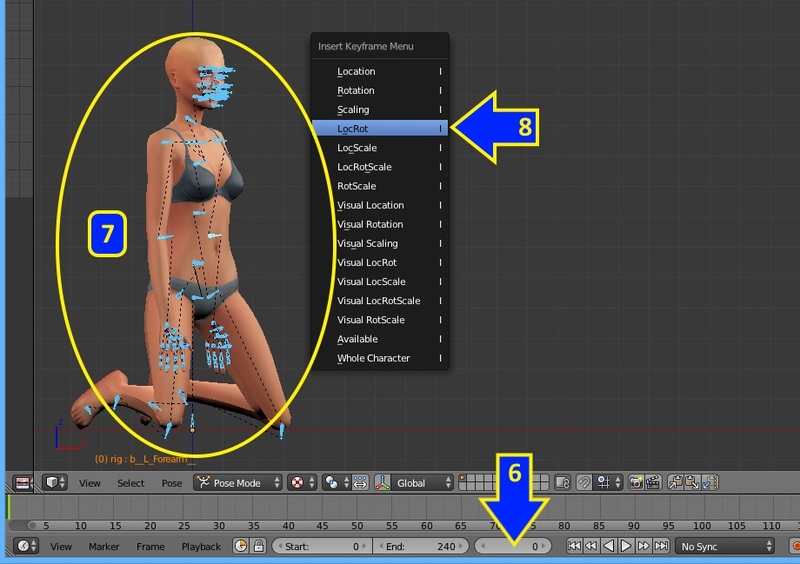 This tutorial assumes you know how to make a pose using Blender. I've written a tutorial showing how to use Blender to make a pose and posted it HERE. Please use the beginners pose tutorial in addition to this tutorial if you are unfamiliar with Blender or with Sims posing. This will save you a lot of time and frustration. Until there is a Pose Player type mod for CAS all custom poses must be put in the game as default overrides of CAS trait animations. Once there is a means of playing custom poses in the game Studio is ready to enable custom poses and animations. 1. 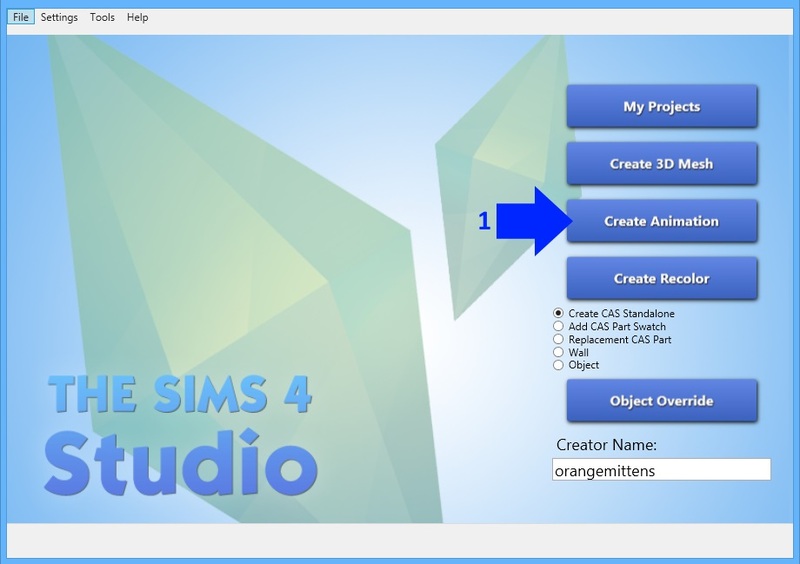 Open Sims 4 Studio and click the Create Animation button. 2. Type the word trait into the search bar. 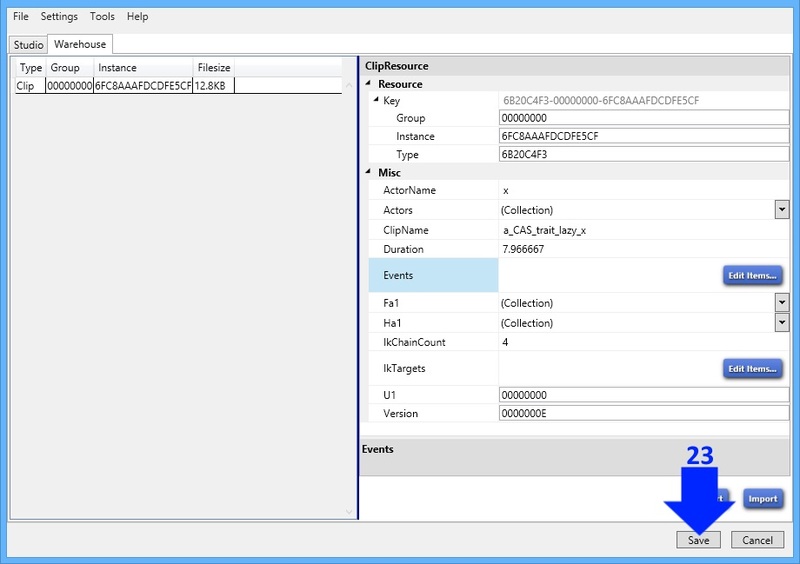 Select a a_CAS_trait to overwrite. 3. For this tutorial I chose the lazy trait. 5. Click Create New. This will give you a blank Clip with the same number of frames as whatever Clip you selected. You can click the dropdown to select the model you want to work with. If you prefer to have EA's Clip click the Export button instead. 6. Once you have named the .blend it will show up in Blender. 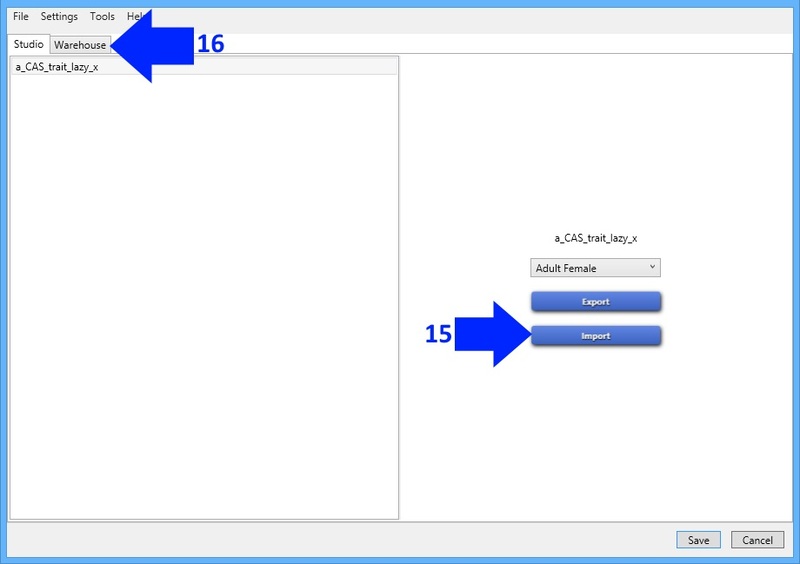 If you selected Create New the model will show up in the bind pose. Create your pose at frame 0. 7. Select all the joints by clicking the a key on your computer keyboard. All the joints should turn blue. 8. Click the i key on your keyboard to get the Insert Keyframe Menu. Select LocRot. pad to get a top view of the model, and then rotate the model. Again select all the joints (click a on your keyboard), and click i to get the Insert Keyframe Menu. Then pick LocRot. 11. Slide the time bar forward to 85 or type 85 into the current frame box. 12. Create your second pose and select all the joints. 13. Click i on your keyboard and choose LocRot. keyframe. Go to the last frame. Make a small change to one joint. Set your keyframe. Save your .blend. 15. Return to Studio and click the Import button. 16. Click the Warehouse tab. 17. 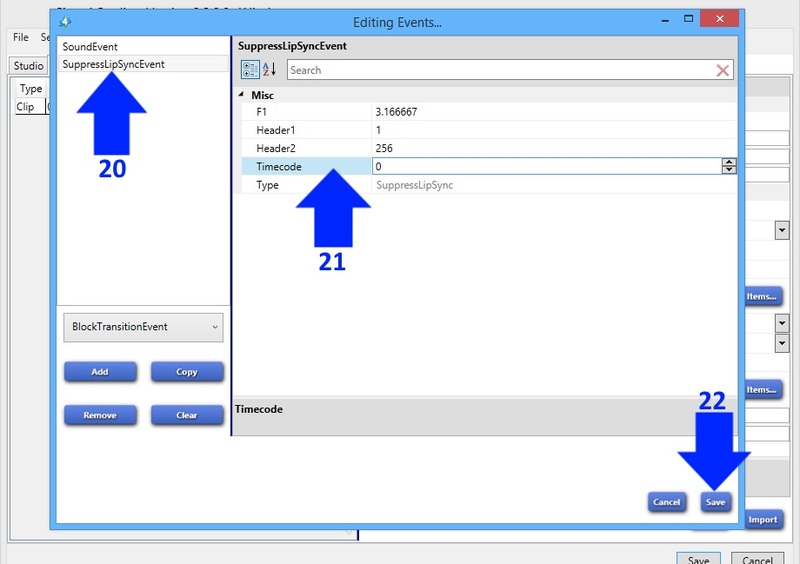 Click the Edit Items button on the Events line. 18. 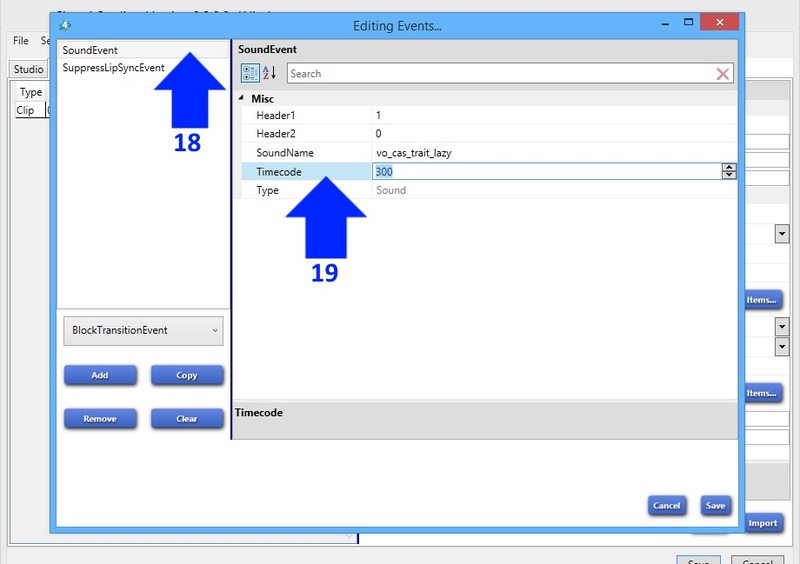 Click the Sound Event line. 19. Change the time code number to something larger than your last frame number. 20. Click the SuppressLipSyncEvent line. 21. Change the Timecode to 0. 22. Click the Save button. 23. The warehouse screen will pop up. Click Save there. 24. Put your pose.package into your Mods folder and check it in the game. It will play well using the casclockspeed at about .1 or .2. To use this: In CAS click Ctrl + Shift + C (the pluses are there to say you need to click all three keys not to indicate you need to click the +). Then enter casclockspeed .2. This will cause the animations in CAS to be played more slowly. You can change the number and select how slowly you want things to play. 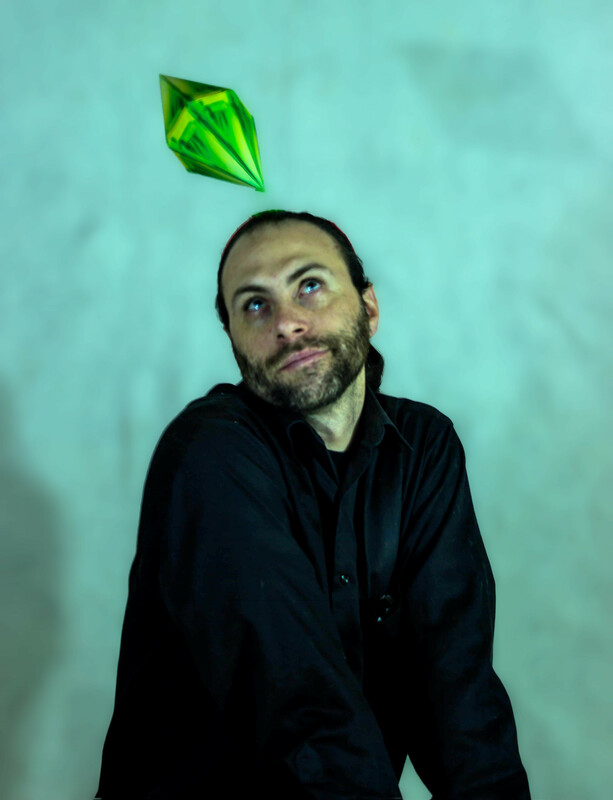 If you enjoyed this tutorial and make some poses please feel free to post pics of your work in the Sims 4 Pictures forum here...I would love to see them! If you post them online for others to share please feel free to post your link in the Custom Content Links forum to let others know where they can get them. Hi OM, thanks for what looks to be a fairly concise tute! After step 4, a package file was created, which I saved to my desktop. I assume that's supposed to happen. I'm stuck on step 5--the program says that it cannot locate my Blender installation. It does not give me an option to locate it manually. Is this because A) my Blender is not installed to the default location, or B) I need to update to 2.70? I'm on 2.67b. I will update if necessary, I did see 2.70 is mentioned up at the top. Hey orangemittens, awesome stuff from you and the team, I already made one successfully. 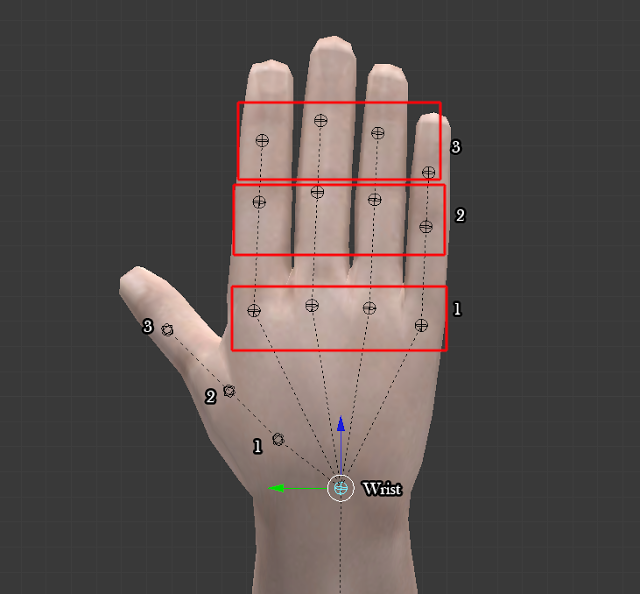 Im trying to work on the hands a bit now but those long pyramids thingies are in the way, how can I make it like this, Ive been googling and pressing all sorts of buttons but no luck. We will work on removing the bone clutter, but in the meantime, you can select the bone and then hide the rig in the outliner while you rotate it and then unhide it to select another bone. Cheers andrew, I just found via google, in the display if I put it on wire and untick the xray its heaps better. Got it, thanks. I got a little confused about how many keyframes to add, but muddled through. Am I just tired, or is the pose a mirror opposite of how I had the rig posed? Hey MisterS This is the closest I have found. On the armature tab under display click "stick" and you can also check the box next to "names" to display the vertex group's (AKA bones) names. Oh, I did nit know it was you's who had done the little circle thing, I thought it was an option in blender. Im using that one at the moment brujah, glad to know its right. I did not know about the armature tab tab though, might make things a little easier, thank you. I really want to Experiment...RIGHT NOW...hahaha...Wifey is on my case...We will get to it. Thanks OM and Staff for the Tut - Groovy' Sunday to All! After a Quick DL and Run through concerning Objects this AM....against Wifey's wishes (hehehe.). I was amazed to see the Anima files listed after clicking Object. 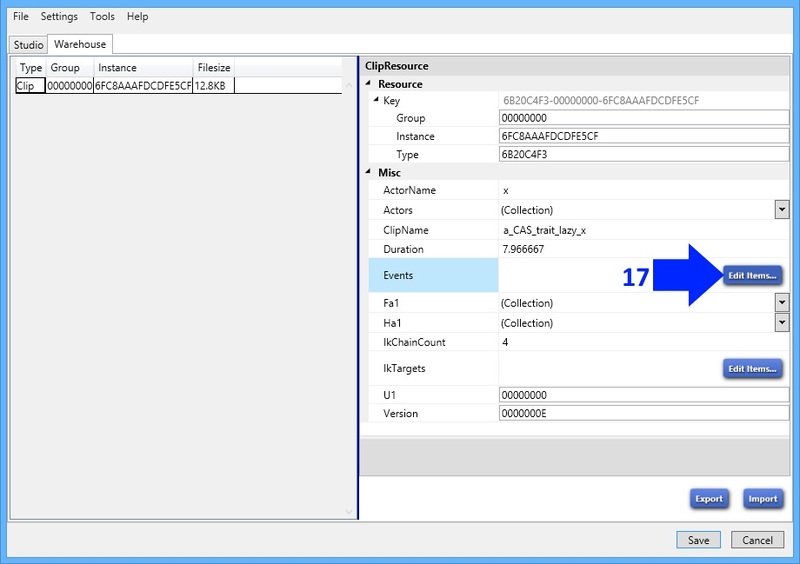 The Main prob with this build of S4S concerning attatching Anima to an Object is: The IK Chain cannot be copied and placed into the RIG - This must be done Manually. 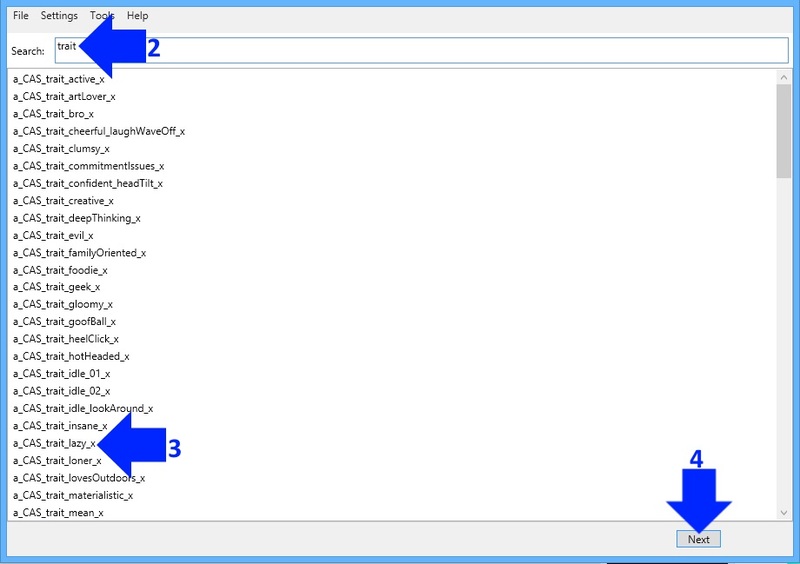 When you click Copy - another File,(extra),will show in what you are Copying from - Which serves no Purpose. Numbers will have to be written down Manually - no biggie - used to that with the Shadow sticky. All in all - Beer Time, Sunday. °Poking and Prodding - The little Joys of Life. P.S. - Paste won't function either. I am so extremely bad at making poses and all that computer-stuff. Is it possible to download other peoples poses? MisterS, Until Andrew gets a chance to clean up the bone clutter one easy way of seeing what you're doing is to select a joint and then hide the rig while you work with it. Then you can unhide the rig to select a different one. sims4Germany, yes I've worked with some of the a2o clips. I've played an animation I made in the main game using one of the a2o mirror clips and it worked just fine. micky, after you name the .blend and save it a box should pop up showing you the folder you saved the .blend into. This is the .blend you want to open in Blender. To select all the joints click the a key on your computer keyboard. If the joints do not all turn blue click the a key again. To get the LocRot you need to click the i key on your computer keyboard. This will make a menu pop up by your mouse cursor and that will be one of the choices on the list. 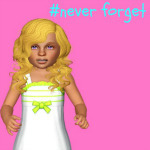 Lauralassen, since this just came out recently there aren't many poses made yet. I posted some here: and MisterS posted some here: . I expect that there will be more out in pretty short time though.